Safety is paramount if you are working in areas with traffic or machinery. At MASCOT, we carry one of the industry's largest selections of fluorescent safety workwear that makes you visible in both daylight and in the dark – all year round. During the warm periods, where safety still has to be a priority, MASCOT hi-vis shorts are the right choice for you. If you work outside on a construction site, you can easily find a pair of MASCOT hi-vis shorts that matches your preferences. 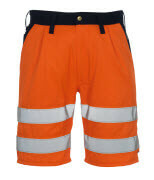 With reflector shorts from MASCOT, you are guaranteed to reach the safety classes that your workplace requires. The MASCOT hi-vis shorts are approved in accordance with the international standard EN ISO 20471, class 1. If you want to achieve a higher safety class, you can combine your hi-vis shorts with a T-shirt or a jacket of fluorescent materials. By using MASCOT’s letter system, you can easily figure out how to combine the fluorescent shorts with other products in order to achieve a higher safety class. In the fluorescent MASCOT® SAFE range, you will find hi-vis shorts in several colours. The fluorescent hi-vis colour makes you visible in daylight. All shorts feature reflectors that ensure that you will easily be spotted via a light source in darker surroundings. All of the shorts in MASCOT’s hi-vis assortment are treated with Teflon®, which makes them dirt repellent, and it ensures you an even higher visibility. In order to guarantee the best durability, the hi-vis shorts are produced with durable triple-stitched seams on the legs and crotch. If you need pockets for tools, mobile phone and glasses, then worry not. On the MASCOT hi-vis shorts, you will find all the right pockets and details, such as an adjustable hammer loop, a ruler pocket and pockets with secure closures.